Disney and Marvel Studios are currently doing their epic Hall H panel right now at San Diego Comic-Con. And one of the big news items expected was the official reveal of the actress playing Captain Marvel. As expected, they have announced that Acaemy-Award winning actress Brie Larson will take on the role of Carol Danvers in this Marvel epic. Earlier in the year, a rumor surfaced that newcomer Emily Carmichael may have landed the Captain Marvel directing gig, and that rumor was also confirmed today. Variety was the first to report that Brie Larson was Marvel's top choice for the title role, and that she was leaning towards taking on this character. 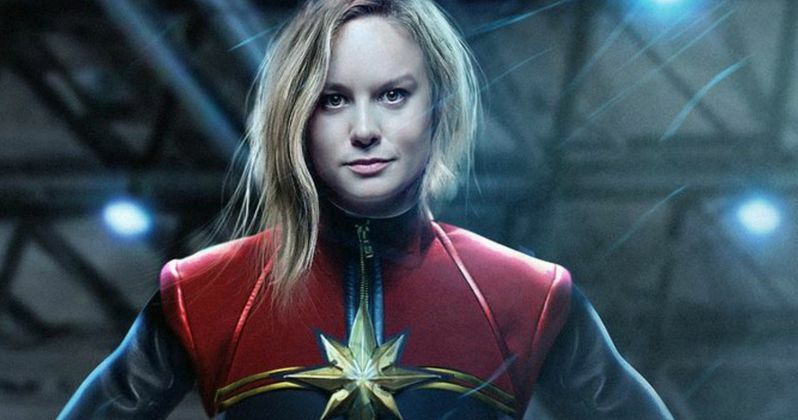 At the time, the site mentioned that Marvel has always planned on locking in an actress early for Captain Marvel, so they could introduce her in other films. It's worth noting that Kevin Feige previously admitted that Captain Marvel was included in an early version of the Avengers: Age of Ultron script, but they didn't want to introduce her as a "fully-formed hero" before fans got to know how she came to be. However, last month, Avengers: Infinity War directors Joe Russo and Anthony Russo let it slip that Captain Marvel will be featured in Avengers: Infinity War, which starts shooting this coming November. We don't know for sure if the deal Brie Larson is negotiating will include a role in Avengers: Infinity War as well, and that wasn't revealed today. Nicole Perlman (Guardians of the Galaxy) and Meg LeFauve (Inside Out) are writing the script for Captain Marvel, but there is very little we know about the story yet. Carol Danvers, a.k.a. Captain Marvel, first debuted in 1968's "Marvel Super-Heroes" #13. She was a U.S. Air Force security chief who is transformed into Captain Marvel following an explosion that involved Kree technology. Among Captain Marvel's powers are superhuman strength and the ability to fly after her DNA was infused with a Kree alien. It's possible that we could see Captain Marvel get her powers at some point during Avengers: Infinity War Part I, which arrives on May 3, 2018, 10 months before Captain Marvel debuts on March 8, 2019. Brie Larson beat out a number of actresses who expressed their interest in the role early on, such as Ronda Rousey and Kathryn Winnick, with Emily Blunt once rumored for the role as well. Brie Larson won her first Oscar earlier this year for her performance in the indie drama Room. She will next be seen in indies such as Wiener-Dog, in theaters June 24, and Free Fire from director Ben Wheatley. She will also star in the highly-anticipated Kong: Skull Island, which hits theaters on March 10, 2017.